The LJP has claimed that it had asked Singh if he wanted to contest from Nawada but he had kept quiet. 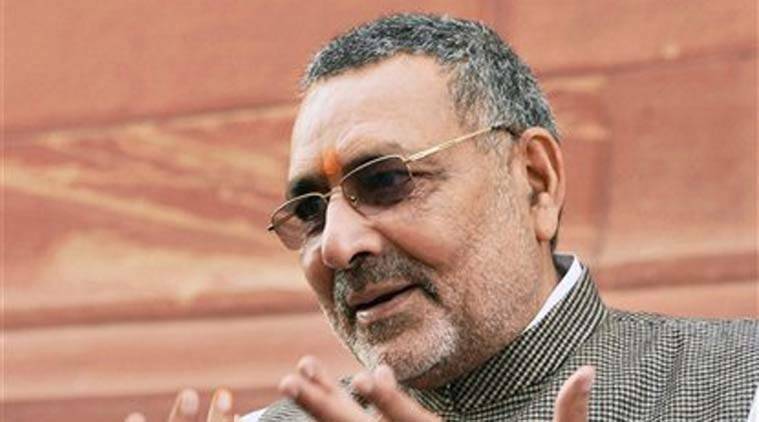 Union minister Giriraj Singh has openly expressed dismay at the BJP conceding his Nawada seat to alliance partner LJP. Speaking to the media on Monday, Singh said: “I do not know what happened. I had been insisting on contesting from Nawada. I have done a lot of work for my constituency. The rural model I raised for Nawada will benefit its people, but it may not benefit me.” He said the party leadership alone could explain why Nawada was conceded to the LJP. When asked if he was ready to contest from Begusarai, Singh said: “I am a party worker and will remain so. I had not come to the BJP as a leader.” Singh is reportedly upset at BJP state president Nityanand Rai for not having recommended Nawada seat among the 17 seats BJP will contest in Bihar. Singh’s displeasure at the party’s decision was criticised by party MLC Rajnish Kumar, who suggested the minister should not “dramatise” and “start preparing to contest from Begusarai”. With the RJD not likely to get into an alliance with CPI, Begusarai looks poised for a three-way contest between the BJP, RJD and CPI candidates. Sources said Singh was uncomfortable about contesting from Begusarai as he had not done ground work and is seen as an outsider there. He would also be up against probable formidable opponents — Kanhaiya Kumar from CPI and Tanvir Hasan from RJD.